Interestingly, these have been new finds – citrine Lemurians found in the pink Lemurian beds! These turned up occasionally, but never in any abundance so imagine my delight when I opened a shipment some time ago and there they were! She is a 4.2 oz, 3.8” by 1.2” by 1” single crystal wand with a very and fairly uniform Dow termination. All of her faces are polished and she is a lovely light gold color with a faint pink blush that interestingly gives her a dichroic effect! In some of the photos, she looks pink and in others, citrine … it all depends on how the light hits her. And she has the typical Lemurian lines, some light and others profound, on her sides with some textural and others, holographic, starbrary glyphs! Although opalescent, she almost disappears when wet, save for her color. Plus, she has a life’s pathway side – one naturally smooth without Lemurian lines or glyphs that directs her Keeper to the dominant and important face. There are a couple of very small dings and one larger near her base, but nothing of significance at all. She will delight you! 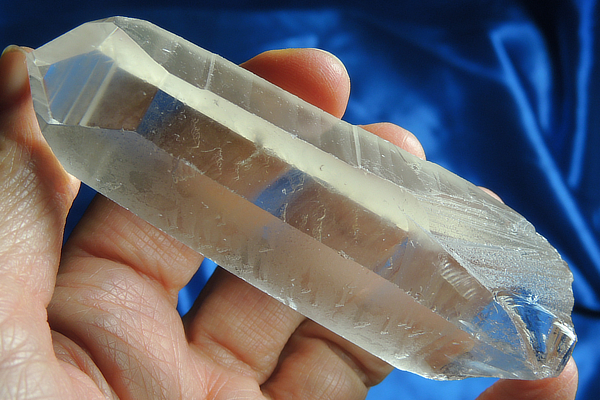 The Dow (7-3-7-3-7-3) configuration is one of the most sought-for Master Crystals. Dows are the perfect transmitters and receivers. Threes represent Mind, Body and Soul; Life, Death, Rebirth. Sevens represent the seven frequencies of the tonal scale, the seven colors of the rainbow, the seven Chakras. Together the 7+3 equals 30: another numeric perfection: ten toes, ten fingers, etc. The sum of all the sides is 30 – another “3” – in the perfection of the circle. Viewed from the top, Dows have only three faces that meet and three that add to the faceted feel. These pink-citrine Lemurians are without a doubt, heart stones that emerged and spoke of love, loving and Self love. And while people don’t think of citrines as heart crystals, in the Ayurvedic systems, yellow is considered heart centered (remember heart of gold?). In addition, when the light is just right, you can see her definite pink coloring, so she has elements of both … plus her wondrous rainbows! This Spirit definitely speaks of the bottomless abundance of love – it is all around us in the spring flowers, our friends, our family and all that we cherish and hold dear. Because her citrine is blushed with pink, she really enforces the abundance of love energies. In trying times, we tend to overlook or forget that these energies are there as a support and yet, they are a “shoulder” to lean on when we need it most. And note too that abundance takes all forms and it isn’t about money and things – an abundance of love is the greatest treasure anyone can know! Her life’s pathway side leads to her dominant seven-sided face and accentuates balance and enlightenment. She will help to connect you to that treasure without end and help you see the true joy in your life!